Very slow growing and spreading, they do produce pretty little purple flowers in Summer too. Supplied as a pack of 3 two year old plants in 9cm pots, to plant straight out. This has to be one of the toughest and most indestructible garden plants - bone hardy, no maintenance required at all, and you can walk all over it!!! Despite being called a 'grass', it is in fact a strappy leaved perennial. 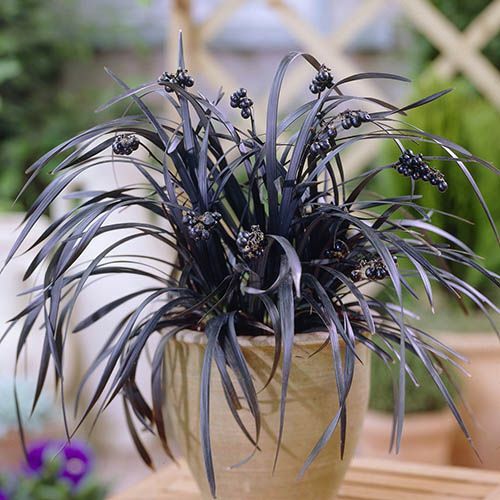 It is one of the very few so called 'black' plants that are actually black - a year round matt black backdrop, to set off bolder and brighter features. It is a very slow spreading, carpet forming plant, and can remain undisturbed for years. You can then chop it up with a spade in Spring and create many more plants too for free! Use it as groundcover, be it shade or sun, drought or wet. it is also great in modern mixed container plantings, it's year round colour a fabulous foil to bright golds, oranges and limes. A very versatile little gem. Supplied as a set of 3 9cm potted plants, good clumps several years old, very tough to plant out at any time of the year.